If you're looking for an attractive way to store a small to medium size television set that won't take up too much space, a corner TV armoire might be the perfect option for you. Finding an attractive way to work a television into the décor of a room can certainly be challenging. Of course, if you have enough money to purchase a large, flat panel television that can be hung on a wall, finding a spot isn't difficult. After all, this type of television is typically quite attractive and can be considered a decorating element unto itself. However, if you have a smaller television set that isn't flat or a relatively small flat panel device that would look lost hanging on the wall, finding a place to put the item where it is both attractive and functional can become quite challenging. 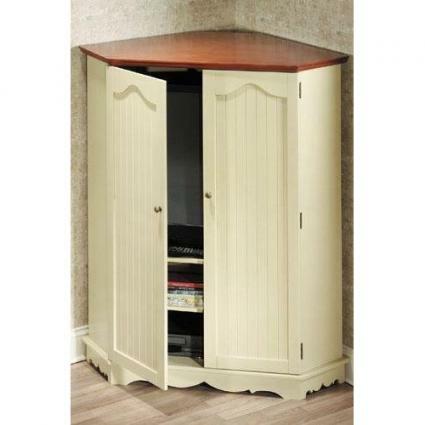 If this describes the situation that you are in, a corner television armoire might be an ideal solution for your needs. While there are several types of television armoires ranging in sizes from small to massive, a corner armoire is often the best solution for television sets ranging from 19 inches to 32 inches. It may also be possible to find corner television storage units that are appropriate for televisions that are smaller or larger in size. There are many corner TV armoire size options, as well as a variety of color and material choices, so it shouldn't be difficult to find a unit that coordinates perfectly with the other furniture pieces in your room. There are many advantages associated with corner armoires. Corner armories for TV sets provide an excellent way to make the most of the space available to you no matter what type of room you need to place a television in. Using a television armoire designed to fit into a corner space is a great way to put an otherwise unusable spot to good use. Corner armoires are excellent options for rooms of all sizes. For example, if you have a large, multipurpose family room, situating a corner armoire at one end of the room allows you to clearly delineate a television viewing area. If you have a smaller room, situating the television in the corner in an armoire keeps you from having to give up valuable wall space to make room for the set. Corner armoires designed to hold television sets are widely available from a variety of sources and to fit all kinds of budgets. You can find heirloom quality wood pieces at stores that sell upscale furniture, low-cost ready to assemble (RTA) options at office supply and mass merchandise stores, and many options between the two extremes. You'll be able to find a piece that meets your needs exactly if you're willing to put in a little time shopping around before making a purchase decision. Before you start shopping for your corner television armoire, you'll need to know the dimensions of the television that you plan to store in the unit. You may know the screen size of the television, as that is what people generally consider when purchasing a television set. However, you need to know the full size of the device, not the diagonal size of the screen. Measure the full width and depth of the television set so that you can purchase an armoire that is an appropriate size. It's also important to think about the armoire features that are most important to you. If you want to hide the television from view when it is not in use, you'll want to focus your search on tall units with doors that cover the television area. If you don't mind the TV set being visible, you may want to choose a unit that has doors above and/or below the area where the television is stored.